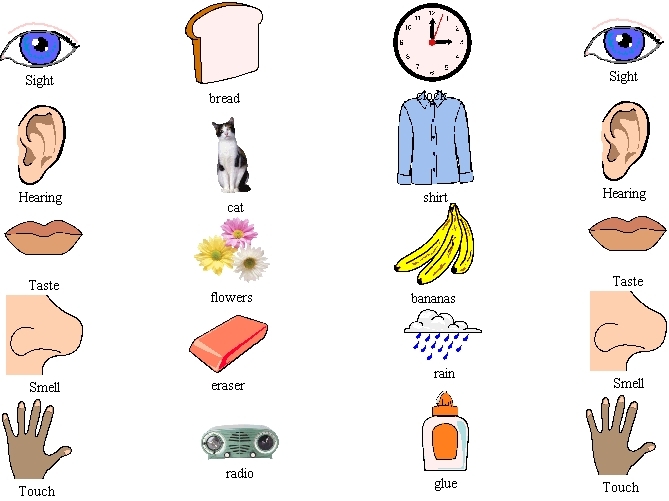 To assess students in their understanding that we can use several different senses to examine one object. 1. Remind students of the activity they previously completed in which they had to put a sense card into the boxes next to the objects they thought the sense could be used for. Ask students what they thought they learned from that object. 2. Hand out matching worksheet. Have them write their names on the back. Explain to students that they will work individually and draw a line from the sense organs to the object that matches it. A match means that you can use that sense to examine the object. They must use a different color marker for each sense so we can tell the matches apart. Tell them they may use rulers as a straightedge if they.d like. Also tell them that they are using colored pencils so if they decide to change a match, they can do so. 3. After everyone has completed the worksheet, collect the pencils, erasers and rulers. 4. Hand out a marker to everyone. 5. Have children discuss their matches in pairs. Tell them to make any new matches with the marker. 6. Discuss the worksheet with the whole group. Allow them to add more matches if needed. 7. Collect papers and date them.